"This is pretty significant reform, this is a dramatic change," the Florida Republican says. Sen. Marco Rubio unveiled his plan to provide paid family leave for most working Americans on Thursday, an idea that would allow families to take weeks off work after having children in exchange for delaying social benefits at the time of retirement. "This is pretty significant reform, this is a dramatic change," Rubio said. "This is not something we intend to pass in a matter of weeks or days. I hope that by offering this bill we'll start a conversation." 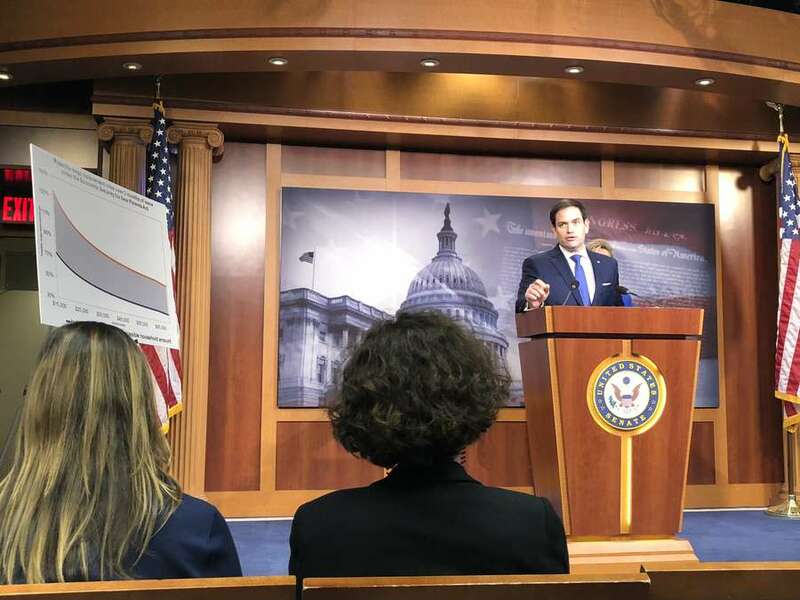 Though Republicans are usually wary of adding new entitlements like paid family leave, Rubio says his plan passes the conservative smell test because it is paid for by families delaying their social security benefits instead of raising taxes. Missouri Rep. Ann Wagner plans to introduce a similar plan in the House of Representatives, though her plan would cut social security payouts by a small amount over a period of time to pay for family leave instead of lengthening the amount of time one would work until they can access federal retirement benefits. Rubio has worked closely with President Trump's daughter and White House advisor Ivanka Trump on a paid family leave plan for months, though Ivanka acknowledged Thursday that a paid family leave plan won't become law during this Congress. "I do believe there is one issue on which we all agree and that is we need to do everything we can to help our children," Rubio said. "It is hurting our children to have parents who are going into debt to spend more time with them." The Florida Republican said he's not worried that his bill would incentivize employers to axe existing paid family leave plans, arguing that only 15 percent of Americans receive such a benefit and that most businesses with paid leave plans are at the high end of the income and talent pool. If an employer cuts an existing paid family leave plan and they don't use the money to pay employees more they'll lose out to competitors, Rubio said. It's unclear whether Rubio's idea has the backing of Senate Republicans. The bill doesn't have any cosponsors and Rubio acknowledged he "got impatient" and introduced the bill to start a debate within the party. Democrats have also proposed paid family leave plans that would not cut social security benefits. Instead, plans like New York Sen. Kirsten Gillibrand's would raise taxes to pay for it. Rubio's plan would apply to every working American and would allow mothers and fathers to share the benefit, and Rubio argued that extending the timeline for social security is a worthy tradeoff because more Americans are earning more money at the end of their careers than they are at the time they have children. "For the Republican Party it's a new issue, its an issue that's traditionally associated with the Democratic Party and the left," Rubio said. The U.S. is one of a handful of countries that does not provide paid time off for parents, though many countries only extend the benefit to mothers.